Our range of products include temoside 100 , temozolomide capsules 100mg, imatib 400 mg tablets, alimta injection, kemocarb injection, zynesp 40 darbepoetin alfa injection and luprocare depot, leuprolide acetate 3.75mg. Usage/Application Temoside 100 Capsule is an anti-cancer medication.,Temoside 100 Capsule is an anti-cancer medication.This stops their growth and multiplication. USES OF TEMOSIDE CAPSULETemoside 100 Capsule is used in the treatment of brain tumor. HOW TO USE TEMOSIDE CAPSULETake this medicine in the dose and duration as advised by your doctor. Swallow it as a whole. Do not chew, crush or break it. Temoside 100 Capsule is to be taken empty stomach.HOW TEMOSIDE CAPSULE WORKSTemoside 100 Capsule is an anti-cancer medication. It enters the brain tissues and works by damaging the genetic material (DNA and RNA) of the cancer cells. 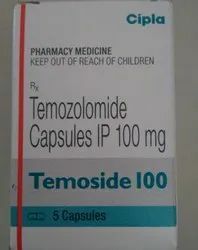 This stops their growth and multiplication.TEMOSIDE CAPSULE RELATED WARNINGSAlcoholInteraction with alcohol is unknown. Please consult your doctor.PregnancyWEIGH RISKS VS BENEFITSTemoside 100 Capsule is unsafe to use during pregnancy. There is positive evidence of human fetal risk, but the benefits from use in pregnant women may be acceptable despite the risk, for example in life-threatening situations. Please consult your doctor.LactationUNSAFETemoside 100 Capsule is unsafe to use during lactation. Data suggests that the drug may cause toxicity to the baby, or the mother is suffering from a condition in which breastfeeding is not advisable.DrivingTemoside 100 Capsule may make you feel dizzy, sleepy, tired, or decrease alertness. If this happens, do not drive.KidneyTemoside 100 Capsule is probably safe to use in patients with kidney disease. Limited data available suggests that dose adjustment of Temoside 100 Capsule may not be needed in these patients. Please consult your doctor. Cautious use is advised in patients with severe kidney disease while they are taking Temoside 100 Capsule.LiverTemoside 100 Capsule should be used with caution in patients with severe liver disease. Dose adjustment of Temoside 100 Capsule may be needed. Please consult your doctor. Limited information is available on the use of Temoside 100 Capsule in these patients. No dose adjustment is recommended in patients with mild to moderate liver disease.WHAT IF YOU MISS A DOSE OF TEMOSIDE CAPSULE?If you miss a dose of Temoside 100 Capsule, take it as soon as possible. However, if it is almost time for your next dose, skip the missed dose and go back to your regular schedule. Do not double the dose. HOW TO USE IMATINIB TABLETTake this medicine in the dose and duration as advised by your doctor. Swallow it as a whole. Do not chew, crush or break it. 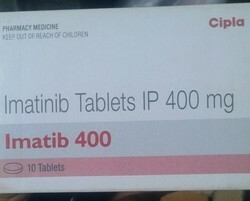 Imatinib 400 Tablet is to be taken with food.HOW IMATINIB TABLET WORKSImatinib 400 Tablet is an anti-cancer medication. It works by blocking the action of the abnormal protein that signals cancer cells to multiply. This helps to stop or slow the spread of cancer cells.IMATINIB TABLET RELATED WARNINGSAlcoholInteraction with alcohol is unknown. Please consult your doctor.PregnancyWEIGH RISKS VS BENEFITSImatinib 400 Tablet is unsafe to use during pregnancy. There is positive evidence of human fetal risk, but the benefits from use in pregnant women may be acceptable despite the risk, for example in life-threatening situations. Please consult your doctor.LactationImatinib 400 Tablet is probably safe to use during lactation. Limited human data suggests that the drug does not represent a significant risk to the baby. After taking Imatinib 400 Tablet avoid breastfeeding for 8 to 9 hours to reduce the exposure to the baby.DrivingImatinib 400 Tablet may cause side effects which could affect your ability to drive.KidneyCAUTIONImatinib 400 Tablet should be used with caution in patients with kidney disease. Dose adjustment of Imatinib 400 Tablet may be needed. Please consult your doctor.LiverImatinib 400 Tablet should be used with caution in patients with severe liver disease. Dose adjustment of Imatinib 400 Tablet may be needed. Please consult your doctor.WHAT IF YOU MISS A DOSE OF IMATINIB TABLET?If you miss a dose of Imatinib 400 Tablet, skip it and continue with your normal schedule. Do not double the dose. Alimta 500 mg Injection is used in the treatment of non-small cell lung cancer and malignant pleural mesothelioma. Alimta 500 mg Injection interferes with the growth of DNA and RNA of the cancer cells by substituting their building blocks. It prevents cancer cells from growing and multiplying. Alcohol Interaction with alcohol is unknown. Please consult your doctor. Pregnancy weighs risks vs benefits Alimta 500 mg Injection is unsafe to use during pregnancy. Lactation Caution Alimta 500 mg Injection should be used with caution during lactation. Breast feeding should be held until the treatment of the mother is completed and the drug is eliminated from her body. Alimta 500 mg Injection may make you feel tired and this may affect your ability to drive. Kidney Caution Alimta 500 mg Injection should be used with caution in patients with kidney disease. Dose adjustment of Alimta 500 mg Injection may be needed. Please consult your doctor. Use of Alimta 500 mg Injection is not recommended in patients with moderate to severe kidney disease. Liver Alimta 500 mg Injection is probably safe to use in patients with liver disease. Limited data available suggests that dose adjustment of Alimta 500 mg Injection may not be needed in these patients. Please consult your doctor. 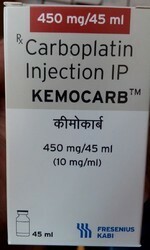 Kemocarb 450 mg Injection is used in the treatment of ovarian cancer and small cell lung cancer. Kemocarb 450 mg Injection is an anti-cancer medication. It works by damaging the genetic material (DNA and RNA) of the cancer cells which stops their growth and multiplication. Pregnancy weighs risks vs benefits Kemocarb 450 mg Injection is unsafe to use during pregnancy. There is positive evidence of human fetal risk, but the benefits from use in pregnant women may be acceptable despite the risk, for example in life-threatening situations. Please consult your doctor. Lactation Unsafe Kemocarb 450 mg Injection is unsafe to use during lactation. Data suggests that the drug may cause toxicity to the baby, or the mother is suffering from a condition in which breastfeeding is not advisable. Driving Kemocarb 450 mg Injection may make you feel dizzy, sleepy, tired, or decrease alertness. If this happens, do not drive. Kidney Caution Kemocarb 450 mg Injection should be used with caution in patients with kidney disease. Dose adjustment of Kemocarb 450 mg Injection may be needed. Please consult your doctor. Use of Kemocarb 450 mg Injection is not recommended in patients with severe kidney disease. Regular monitoring of kidney function tests may be advised while you are taking this medicine. Liver Kemocarb 450 mg Injection is probably safe to use in patients with liver disease. Limited data available suggests that dose adjustment of Kemocarb 450 mg Injection may not be needed in these patients. Please consult your doctor. What If You Miss A Dose Of Kemocarb Injection? If you miss a dose of Kemocarb 450 mg Injection, please consult your doctor. USES OF ZYNESP INJECTIONZynesp 40 Injection is used in the treatment of anemia due to chronic kidney disease and anemia due to chemotherapy. HOW TO USE ZYNESP INJECTIONYour doctor or nurse will give you this medicine. Kindly do not self administer.HOW ZYNESP INJECTION WORKSZynesp 40 Injection is an erythropoiesis-stimulating agent (ESA). It works by stimulating the bone marrow (soft tissue inside the bones which produces red blood cells) to produce more red blood cells.ZYNESP INJECTION RELATED WARNINGSAlcoholInteraction with alcohol is unknown. Please consult your doctor.PregnancyWEIGH RISKS VS BENEFITSZynesp 40 Injection may be unsafe to use during pregnancy. Animal studies have shown adverse effects on the foetus, however, there are limited human studies. The benefits from use in pregnant women may be acceptable despite the risk. Please consult your doctor.LactationZynesp 40 Injection is probably safe to use during lactation. Limited human data suggests that the drug does not represent a significant risk to the baby.DrivingSAFEZynesp 40 Injection does not usually affect your ability to drive.KidneySAFEZynesp 40 Injection is safe to use in patients with kidney disease. No dose adjustment of Zynesp 40 Injection is recommended.LiverCAUTIONZynesp 40 Injection should be used with caution in patients with liver disease. Dose adjustment of Zynesp 40 Injection may be needed. Please consult your doctor.WHAT IF YOU MISS A DOSE OF ZYNESP INJECTION?If you miss a dose of Zynesp 40 Injection, take it as soon as possible. However, if it is almost time for your next dose, skip the missed dose and go back to your regular schedule. Do not double the dose. USES OF LUPROCARE INJECTIONLuprocare Depot 3.75 mg Injection is used for prostate cancer, endometriosis, uterine fibroids and precocious puberty. It is also used to reduce the thickness of the endometrium of the uterus in preparation for surgery. HOW TO USE LUPROCARE INJECTIONYour doctor or nurse will give you this medicine. Kindly do not self administer.HOW LUPROCARE INJECTION WORKSLuprocare Depot 3.75 mg Injection is a hormone similar to the one produced by a hypothalmus gland in the brain. It works by decreasing the blood levels of testosterone in males.LUPROCARE INJECTION RELATED WARNINGSAlcoholInteraction with alcohol is unknown. Please consult your doctor.PregnancyCAUTIONLuprocare Depot 3.75 mg Injection is highly unsafe to use during pregnancy. Human and animal studies have shown significant adverse effects on the foetus. Please consult your doctor.LactationNo information is available on the use of Luprocare Depot 3.75 mg Injection during lactation. Please consult your doctor.DrivingDo not drive unless you are feeling well. Do not drive or operate machinery if you experience drowsiness, dizziness or visual disturbances whilst being treated with Luprocare Depot 3.75 mg Injection.KidneyThere is limited information available on the use of Luprocare Depot 3.75 mg Injection in patients with kidney disease. Please consult your doctor.LiverThere is limited information available on the use of Luprocare Depot 3.75 mg Injection in patients with liver disease. Please consult your doctor.WHAT IF YOU MISS A DOSE OF LUPROCARE INJECTION?If you miss a dose of Luprocare Depot 3.75 mg Injection, please consult your doctor. Anti Cancer Medicine Type pancreatic cancer,breast cancer,non-small cell lung cancer and stomach cancer. 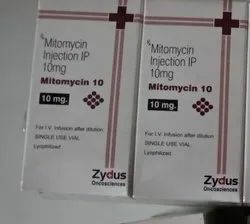 USES OF MITOMYCIN INJECTIONMitomycin 40 mg Injection is used in the treatment of pancreatic cancer, breast cancer, non-small cell lung cancer and stomach cancer. HOW TO USE MITOMYCIN INJECTIONYour doctor or nurse will give you this medicine. Kindly do not self administer.HOW MITOMYCIN INJECTION WORKSMitomycin 40 mg Injection is an anti-cancer medication. It works by damaging the genetic material (DNA) of the cancer cells and stops their growth and multiplication.MITOMYCIN INJECTION RELATED WARNINGSAlcoholInteraction with alcohol is unknown. Please consult your doctor.PregnancyCAUTIONMitomycin 40 mg Injection is highly unsafe to use during pregnancy. Human and animal studies have shown significant adverse effects on the foetus. Please consult your doctor.LactationCAUTIONMitomycin 40 mg Injection should be used with caution during lactation. Breast feeding should be held until the treatment of the mother is completed and the drug is eliminated from her body.DrivingDo not drive unless you are feeling well. Mitomycin 40 mg Injection may cause nausea and vomiting and thereby reduce your reaction times to such an extent that the ability to drive a motor vehicle is impaired.KidneyCAUTIONMitomycin 40 mg Injection should be used with caution in patients with kidney disease. Dose adjustment of Mitomycin 40 mg Injection may be needed. Please consult your doctor. Use of Mitomycin 40 mg Injection is not recommended in patients with end-stage kidney disease.LiverCAUTIONMitomycin 40 mg Injection should be used with caution in patients with liver disease. Dose adjustment of Mitomycin 40 mg Injection may be needed. Please consult your doctor. Use of Mitomycin 40 mg Injection may not be recommended in some patients with liver disease. Usage/Application It works by lowering the amount of estrogen (natural female hormone) produced in the body. USES OF ARIMIDEX TABLETArimidex 1 mg Tablet is used in the treatment of breast cancer. It is used with other treatments, such as surgery or radiation, to treat breast cancer in women who have attained menopause. HOW TO USE ARIMIDEX TABLETTake this medicine in the dose and duration as advised by your doctor. Swallow it as a whole. Do not chew, crush or break it. Arimidex 1 mg Tablet may be taken with or without food, but it is better to take it at a fixed time.HOW ARIMIDEX TABLET WORKSArimidex 1 mg Tablet is an aromatase inhibitor. It works by lowering the amount of estrogen (natural female hormone) produced in the body. This can lower or stop the growth of some breast cancer cells that need estrogen to grow.ARIMIDEX TABLET RELATED WARNINGSAlcoholInteraction with alcohol is unknown. Please consult your doctor.PregnancyWEIGH RISKS VS BENEFITSArimidex 1 mg Tablet is unsafe to use during pregnancy. There is positive evidence of human fetal risk, but the benefits from use in pregnant women may be acceptable despite the risk, for example in life-threatening situations. Please consult your doctor.LactationUNSAFEArimidex 1 mg Tablet is unsafe to use during lactation. Data suggests that the drug may cause toxicity to the baby, or the mother is suffering from a condition in which breastfeeding is not advisable.DrivingArimidex 1 mg Tablet may make you feel dizzy, sleepy, tired, or decrease alertness. If this happens, do not drive.KidneyArimidex 1 mg Tablet should be used with caution in patients with severe kidney disease. Dose adjustment of Arimidex 1 mg Tablet may be needed. Please consult your doctor. Limited information is available on the use of Arimidex 1 mg Tablet in these patients. No dose adjustment is recommended in patients with mild to moderate kidney disease.LiverCAUTIONArimidex 1 mg Tablet should be used with caution in patients with liver disease. Dose adjustment of Arimidex 1 mg Tablet may be needed. Please consult your doctor. Limited information is available on the use of Arimidex 1 mg Tablet in these patients. No dose adjustment is recommended in patients with mild to moderate liver disease.WHAT IF YOU MISS A DOSE OF ARIMIDEX TABLET?If you miss a dose of Arimidex 1 mg Tablet, take it as soon as possible. However, if it is almost time for your next dose, skip the missed dose and go back to your regular schedule. Do not double the dose.